April 9, 2019 - The 8.4-meter LSST Primary/Tertiary Mirror (M1M3) set sail from Houston, Texas, on Friday, April 5th! Along with some other LSST cargo, the M1M3 is securely stowed aboard the BBC Manitoba for an ocean voyage to Coquimbo, Chile; the trip is expected to take about five weeks. You can track the progress of the ship by entering the vessel's name in the search bar at this website. March 26, 2019 - UPDATE: The M1M3 has arrived in Houston and is now waiting for the ship that will take it to Chile. The trip from Tucson to Houston was uneventful for the mirror, but sparked a lot of curiosity from motorists who had to make way for this very oversized load! More photos, provided by transport company Precision Heavy Haul, Inc., are available in the LSST Gallery. March 5, 2019 - The object in this photo, called the calibration screen reflector, was manufactured in the National Optical Astronomy Observatory (NOAO) instrument shop, which is located in the same building as the LSST Project Office in Tucson, Arizona. Our talented instrumentation team has been working on this piece of equipment for many months, and it shows! The reflector will be an important component of the calibration system inside the dome of LSST; this system is designed to determine how real-world factors like dust, and evolution to the sensitivity of the equipment over time, affect the images taken by the LSST Camera. February 8, 2019 - The challenge to viewing and imaging celestial objects from the Earth’s surface is that the Earth’s atmosphere distorts light from space. When you look up at the stars and see them twinkle, you’re experiencing this phenomenon; light from stars is (generally) constant, but the light that reaches your eyes has been pushed around by turbulence in the Earth’s atmosphere. That turbulence is caused by the interaction of varying temperature and density layers between the Earth’s surface and space. Twinkling stars might be pretty to look at, but they’re pretty annoying for scientists who want a crisp, clear view of the objects they’re studying. January 28, 2019 - The LSST Primary/Tertiary Mirror (M1M3) is currently in the Richard F Caris Mirror Lab at the University of Arizona for optical testing. In January, the M1M3 on its support system was positioned at the bottom of the lab’s interferometry tower in anticipation of two test campaigns. The first, which has just concluded, took place from January 14-25. The second campaign is scheduled for February 11-22. The tests use specialized optical equipment to evaluate the figures of the M1 and M3 mirror surfaces. Separate instruments, called interferometers, are used to perform measurements on each of the two mirrors that make up the monolith. The interferometer used to test M1 is at the very top of the tower, and the one used to test M3 is lower down, on a movable bridge. The mirror surfaces are tested separately, first M1, then M3, then M3 again, then M1. When M1 is being tested, the lower interferometer is moved out of the optical path. During the test process, the interferometer in use emits two beams of light. One travels to the mirror and bounces back, and the other goes to a reference within the interferometer. The interaction between the two beams of light is recorded in an image called an interferogram (the black and white image in the photo to the left). The lines in the image are called interference fringes, and each one represents approximately 300 nanometers. A tight grouping of lines indicates a steep change in the height of the surface, much like tight lines on a topographic map indicate steep terrain. A “perfect” mirror interferogram would be a solid color, because its measurements would be recorded as a single fringe. But according to LSST Telescope and Site Mechanical Engineer Tucker Booth, achieving perfection on individual mirrors isn’t the goal. Instead, it’s the optimization of the entire M1M3 monolith that will ensure the best possible images during LSST Operations. Allowing adequate time for optical testing, analysis, and optimization in Tucson reduces the work that will have to be done to prepare for operations once the telescope is assembled in Chile. Additionally, the unique testing environment available at the Richard F Caris Mirror Lab isn’t available in the summit facility building, so LSST is fortunate to have access to this world-class facility for the M1M3 optical test campaigns. M1M3 is currently scheduled to ship from the U.S. to Chile in May. January 14, 2019 - The 233rd Meeting of the American Astronomical Society (AAS) wrapped up on January 10; this year’s winter meeting took place in Seattle, WA, with more than 3000 people registered. LSST staffed an exhibitor booth during the meeting within the National Science Foundation’s (NSF) Pavilion, giving project updates and answering questions from conference attendees. Numerous posters and talks were presented by LSST Project and Science Collaboration members. December, 2018 - The Telescope Mount Assembly (TMA) finished Factory Acceptance Testing at Asturfeito in Spain, and is now ready for disassembly and shipping to Chile. 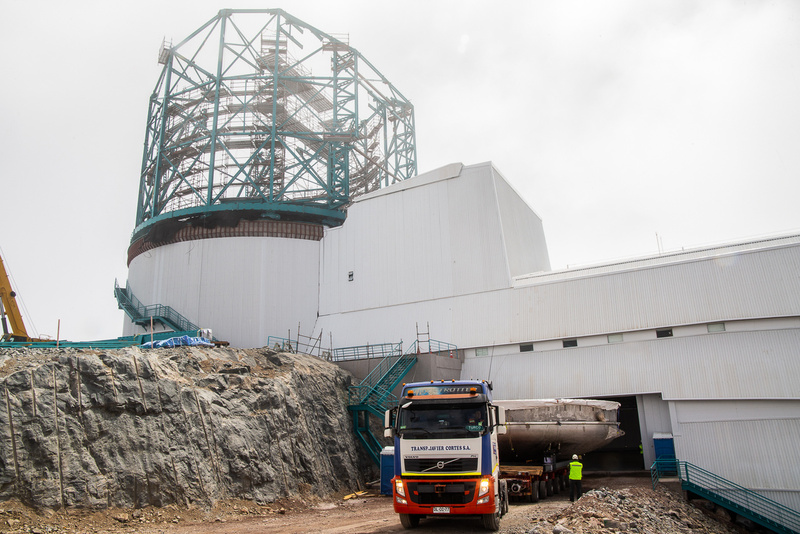 The LSST Secondary Mirror (M2) also arrived in Chile on December 7th, and will reach Cerro Pachon before the end of the year. What’s in store for 2019? Delivery of more critical pieces of equipment to the summit, including the Telescope Mount Assembly and M1M3 Mirror and Cell Assembly; coating of the Secondary Mirror (M2) on the summit; progress towards determining the LSST observing cadence; and much more. Visit lsst.org and follow LSST on social media for the latest updates! It is with great regret that we inform you of the sudden passing of Jim Parsons, one of our NCSA colleagues. Our thoughts are with his family and our team at NCSA. There will be a DM community post (https://community.lsst.org/c/dm) with arrangements when we know them, and an opportunity to express sentiments to be forwarded to the family. November 20, 2018 - The LSST Network Engineering Team (NET) had a strong presence at the Supercomputing 2018 Conference (SC18) in Dallas, TX, last week, including a successful demonstration of the data transfer capabilities of the fiber optic networks that will be used during LSST operations. Digital data were transferred from the Base Site in La Serena, Chile, to the LSST Data Facility at the National Center for Supercomputing Applications (NCSA) in Champaign, IL. During the data transfer demonstration, a peak rate of 100 Gigabits/second (Gb/s) was achieved for short periods, and a sustained rate of 80 Gb/s was achieved over a three hour period, exceeding the test target. November 12, 2018 - It looked a lot like a space ship before it was wrapped for shipping, but it’s actually a very earth-bound piece of cargo: the Coating Chamber for the mirrors of the Large Synoptic Survey Telescope (LSST). 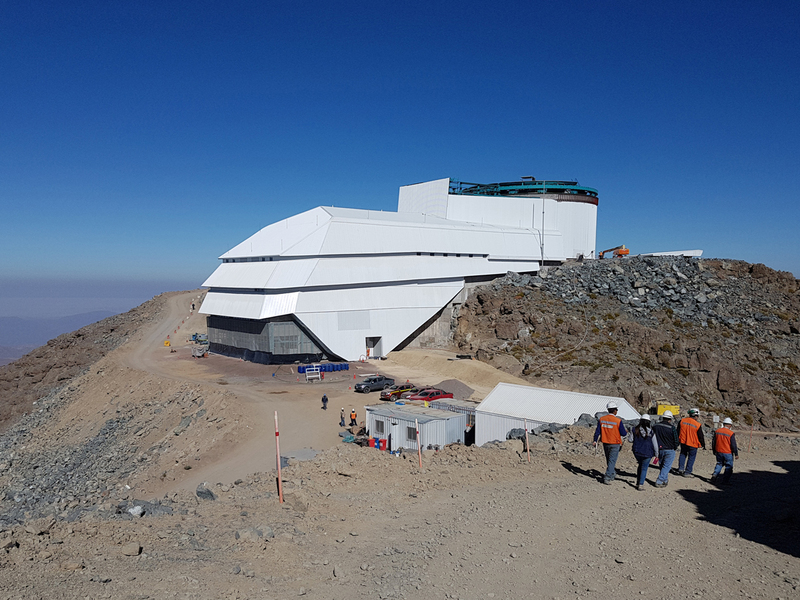 The Coating Chamber arrived on the summit of Cerro Pachón in Chile on November 11, 2018, and is now positioned on the service floor of the LSST summit facility building. The Coating Chamber and its associated equipment will share this level with the camera maintenance rooms, the vertical platform lift, and the shipping and receiving area. The Coating Chamber will be used to coat LSST’s mirrors when they arrive on Cerro Pachón, and to re-coat the mirrors periodically during Operations.